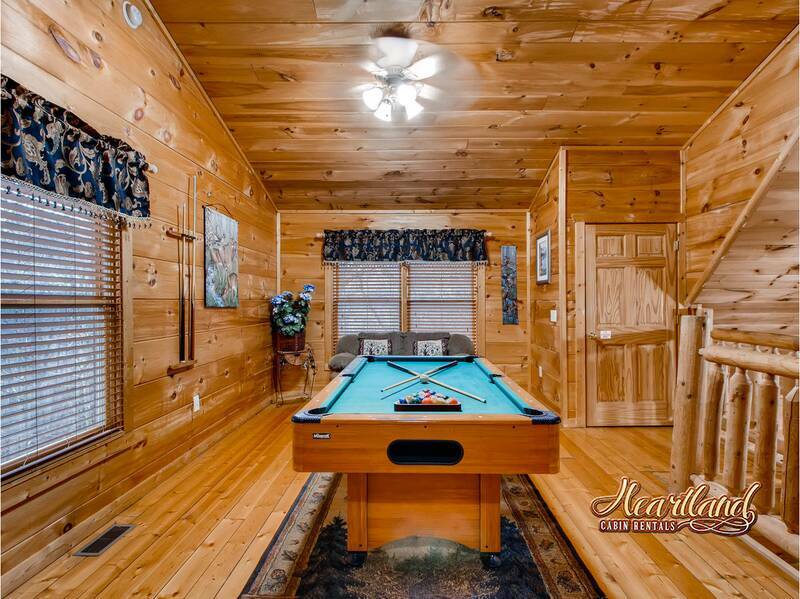 Enjoy a fun-filled stay with someone special when you book "Naughty Pines" in Sky Harbor Resort! 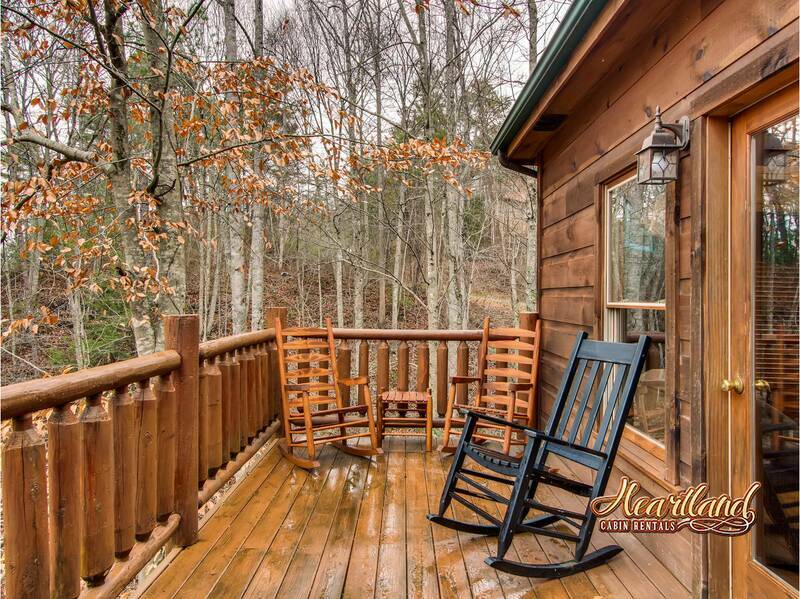 Nestled in the mountains a short drive from the Spur Road area, this cabin offers convenient access to both Pigeon Forge and Gatlinburg. 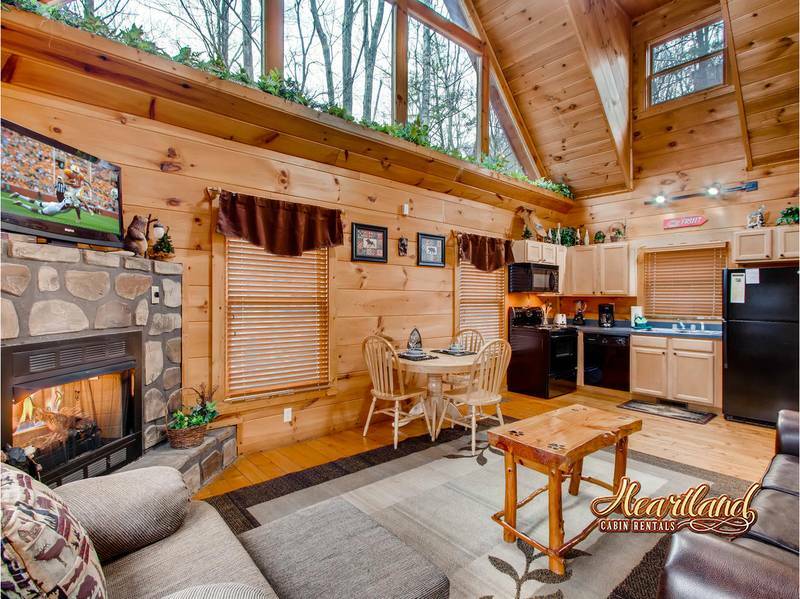 If you're planning a romantic retreat or honeymoon in the Smoky Mountains, this 1-bedroom cabin has all the amenities you need to make special memories. 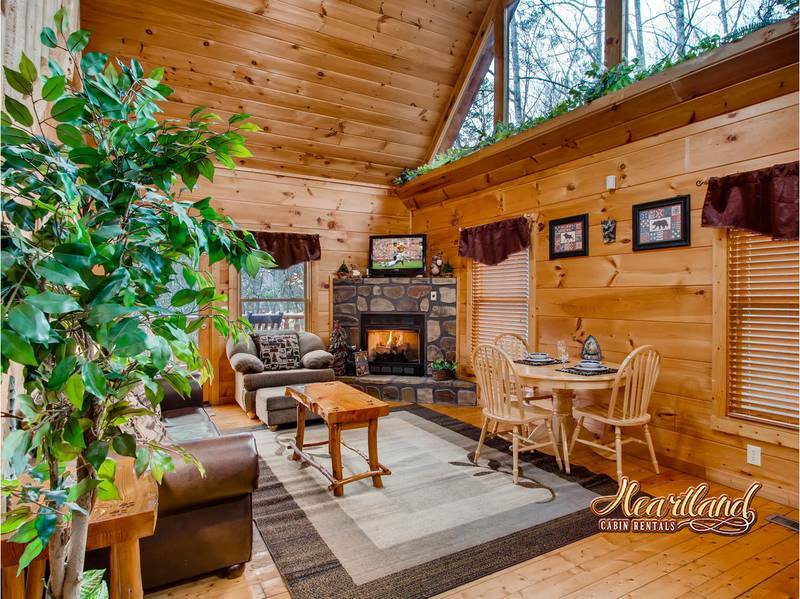 Snuggle up on leather furnishings by the gas-log fireplace in the living room while you watch a movie on the flat screen television. Enjoy a candle-lit dinner for two in your kitchen or dine outside on the deck surrounded by the sights and sounds of nature. 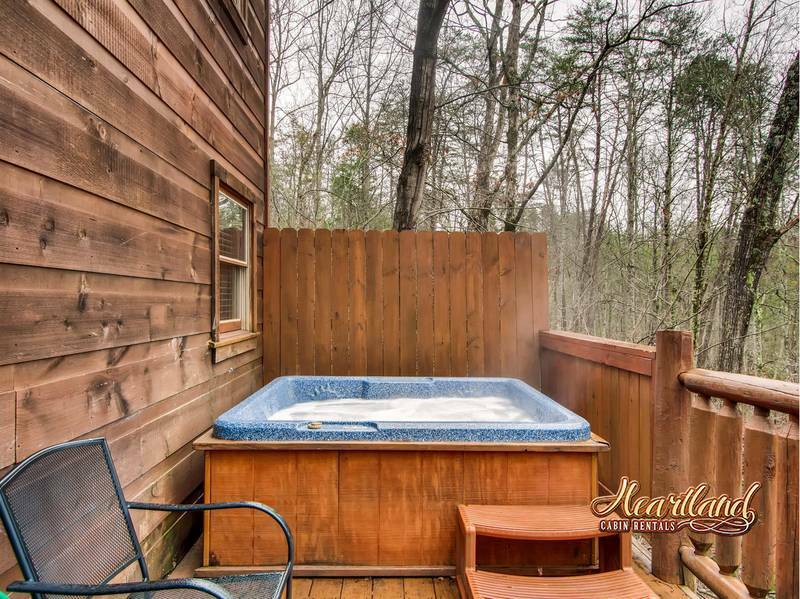 After dinner, you can rest your weary bones in the hot tub on the deck surrounded by a beautiful forest canopy. For more privacy, your rental's king bedroom even features an in-room jacuzzi tub that's perfect for relaxing with your sweetheart. 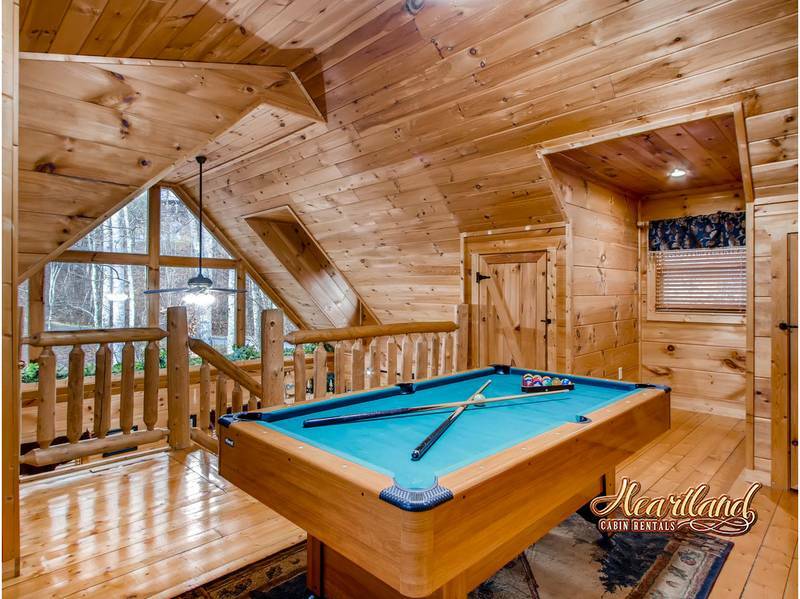 For a bit of playful fun, why not challenge your partner to a game of billiards in the upstairs game room? After a great night's rest in the master bedroom with a log frame king bed, a flat-screen television, and a jacuzzi tub, you can enjoy a quick breakfast made from your rental's kitchen and while you make plans for your first day in the Smokies! Other convenient features included in this cabin are a washer/dryer, charcoal grill and pool table. 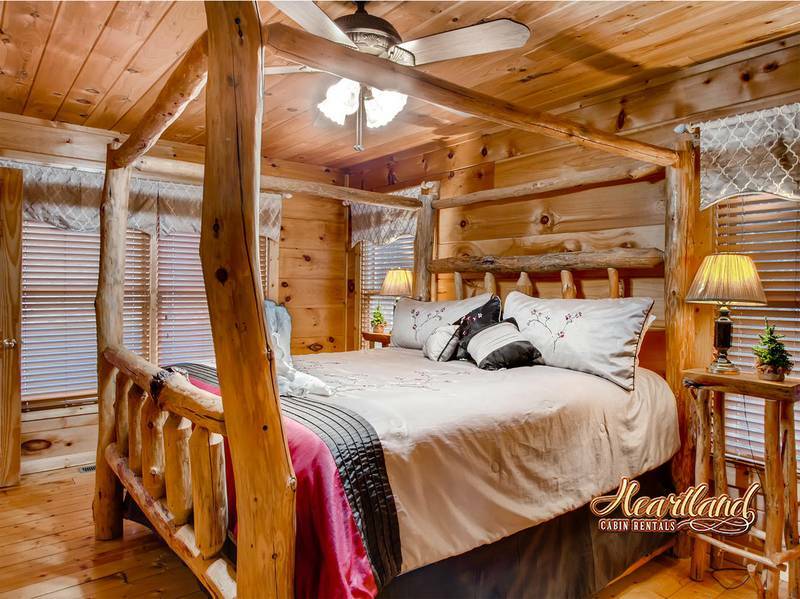 However you choose to spend your fun and romantic vacation in the Smoky Mountains, you're bound to love this cozy cabin with everything you need to make special memories. My husband surprised me with a last second weekend getaway for my birthday. It was our first trip away from our children in over 2 years! It was so last second, we called and booked it the same day we decided to depart, we didn't even view the cabin prior, so we were a little apprehensive. We were completely shocked at how perfect the cabin was! It was clean, tidy, modernized, private, and well equipped for just the two of us. We especially appreciated the comfortable bed, clean linens, and cozy hot tub. 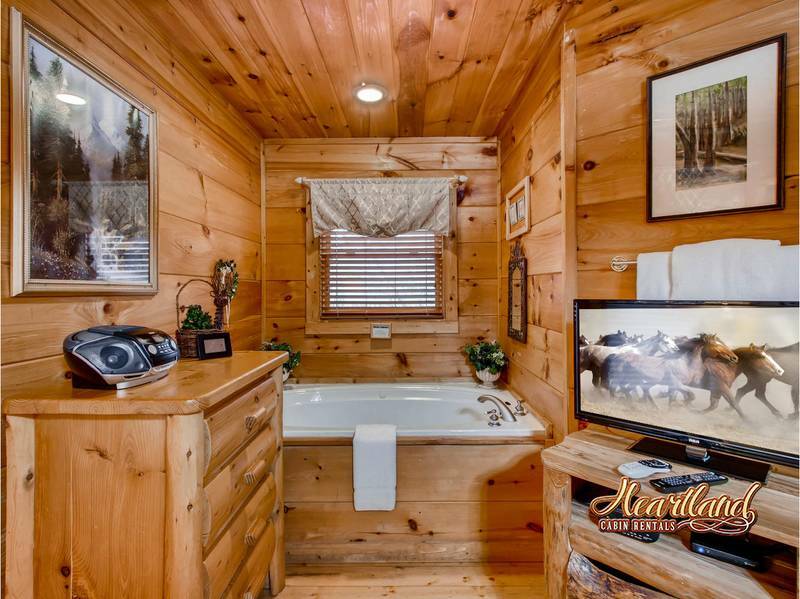 This cabin will definitely be a go to for us in the future, and Heartland will be our first choice for any family vacas too! We had SO much fun staying at naughty pines, it was so clean! We were located very close to town and I highly recommend staying here the jacuzzi tub is EVERYTHING!!! Very secluded!! Perfect getaway! The couch is very uncomfortable and has no support. Espn would be a channel to add on the TV. Other than these minor things, it’s perfect! The cabin was fantastic with a good view. The whole cabin experience was awesome! The only complaint I have is this: the bedroom windows facing the front of the property need curtains that you can pull to cover the windows. The blinds closed but you could still see inside the bedroom from the outside, which is a bit uncomfortable. We loved the look and feel of the cabin. It was out in the wilderness but close to all amenities. It was decorated very nice and loved the feel of the outdoors. My wife and I truely enjoyed spending our Birthdays in this beautiful cabin and will definitely be back in the future. Finding the cabin was very easy to get to. Needed a little assistance getting use to how the alarm system worked but with the help of the heartland staff member we called ,it became a breeze to figure out. Loved sleeping in the King size bed each night after a long day of site seeing. Very comfortable Each afternoon we enjoyed the back deck , however we could hear the traffic from the main road. Would of liked to have been in an area where we did not hear that.. Once inside the cabin you did not hear any of the traffic and it was very peaceful. The cabin pretty much had everything we needed. 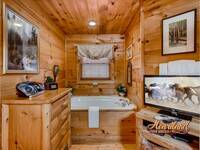 This is our second cabin we have rented from heartland and have been greatly pleased on both occasions. We will definitely return in the future and look forward to our next stay. The cabin was beautiful. It was centered between Gatlinburg and Pigeon Forge and really in the perfect spot. Extremely peaceful and exactly what we needed in our vacation. We will definitely be back again soon! We came to the Naughty Pines Cabin to celebrate our honeymoon. 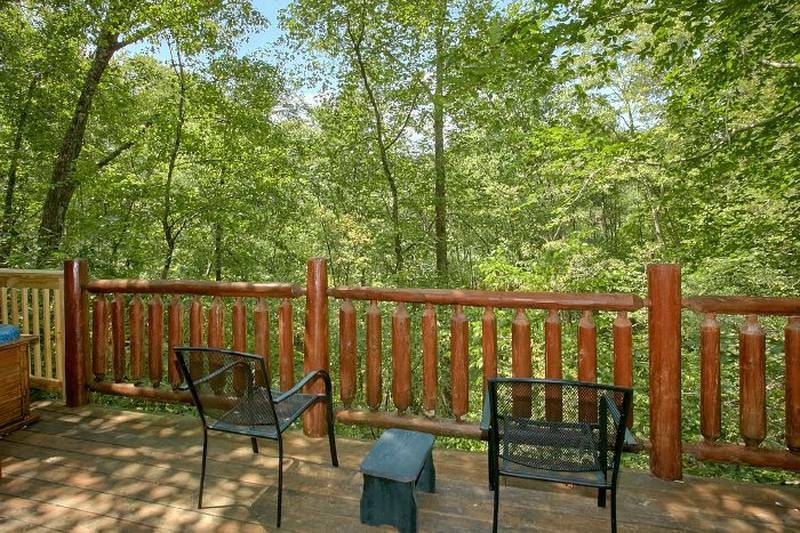 The cabin was clean, secluded, beautiful and not far from all the attractions in Pigeon Forge. We stayed 5 nights and we look forward to returning soon with our family. 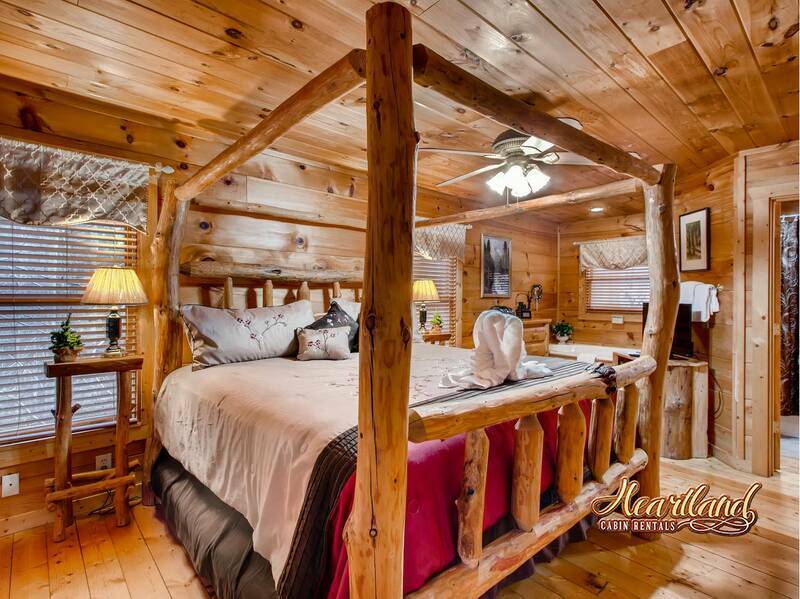 AMAZING, PERFECT ROMANTIC GETAWAY, BEAUTIFUL ACCOMMODATIONS! 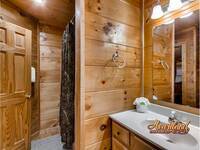 This was a perfect romantic getaway, cabin was decorated perfectly and extremely clean. It had all that we needed and the view was gorgeous. Will definitely come back and bring friends and family with us next trip. We once again enjoyed our annual trip to the area. 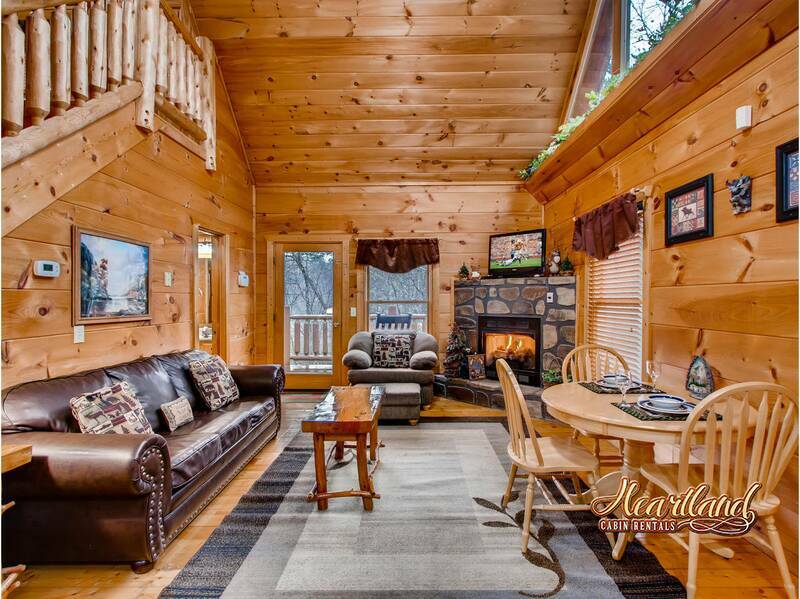 The Naughty PInes cabin was a relaxing haven after the the various hikes and shopping excursions. We began and ended each day in the hot tub, which is a treat we will miss when we return home. 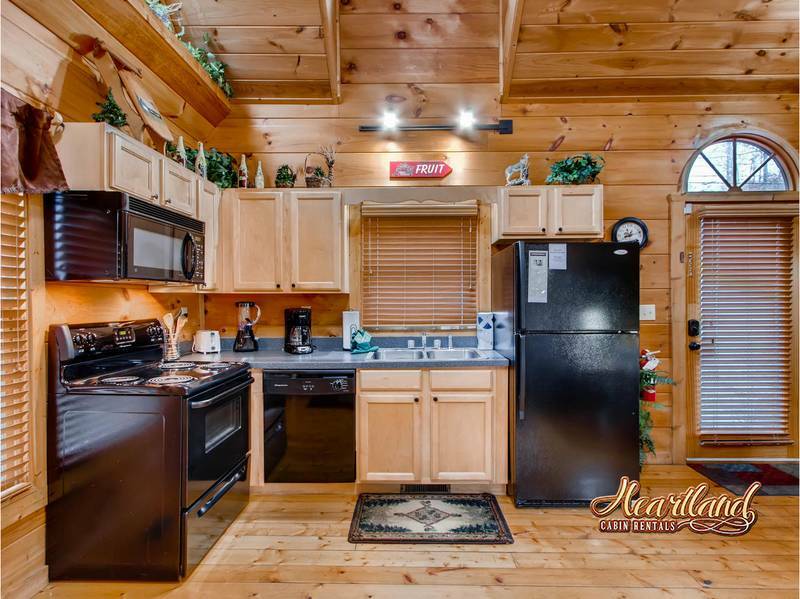 The staff at Heartland Cabin Rentals was always friendly and responded to issues quickly. We look forward to returning!